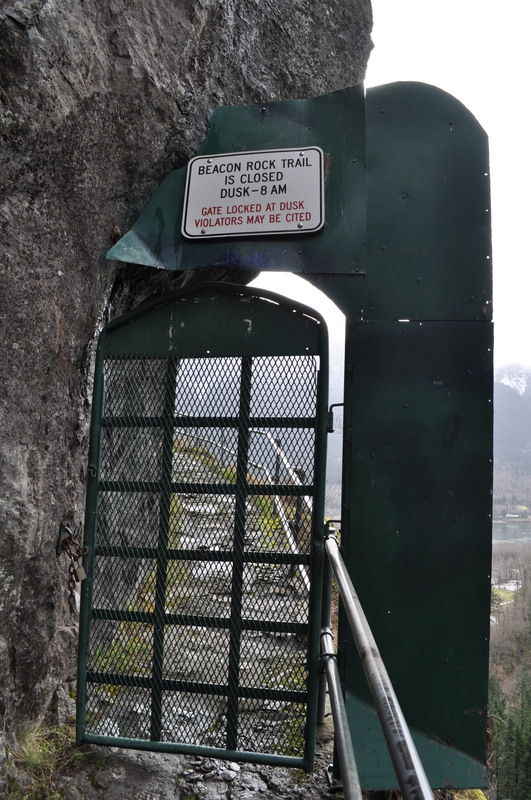 Arno and I tried to hike up Beacon Rock today but our plans were foiled by a locked gate. 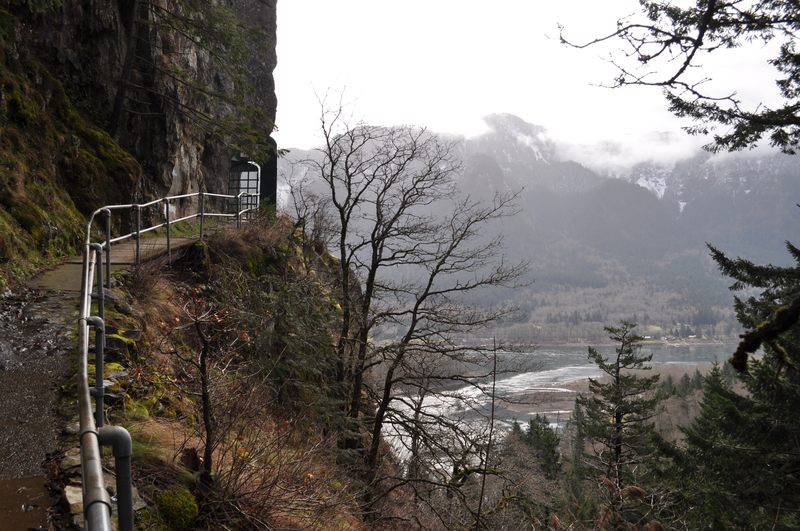 There is no equal to the majestic view of the great Columbia River Gorge from a height. …but what is that? A door? A locked door, preventing would-be trespassers, wishing to pretend ignorance of the “closed trail” signs. We parked and bought a season pass anticipating future hikes. A public service announcement to anyone heading this way: buy a pass at the trailhead! The Internet says there is no fee, but you must have a parking pass. A car next to us had been ticketed. 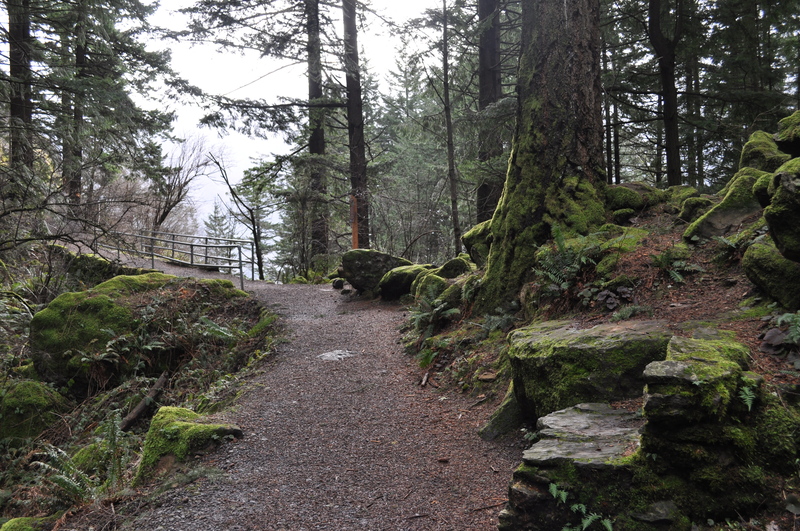 Signs were clearly posted that the trail was off limits due to a rock fall in the winter. There were also notices that not all of the climbing faces were open. We walked round the barrier, and, finding the trail nothing but inviting – and noting the official Park vehicle parked across the road – remarked aloud that we would only be investigating the accessibility of the climbing wall. I had hoped to find the rock slide and pick my careful way through it, and beg forgiveness should the Park official come after us. 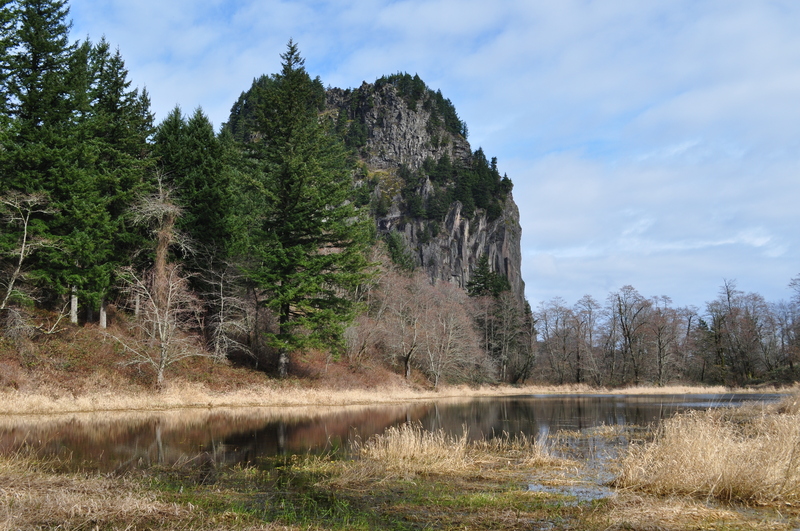 It was my first trip to Beacon Rock, and I eagerly anticipated ascent. We checked the climbing wall, noticed some hardware fixed and waiting for one of Arno’s future attempts. Then, with no one about, we continued up the beautifully maintained trail. Around a couple turns we were able to see that there was no danger of us choosing to break the rules. The steel gate was chained and locked and there would be no passing it. Don’t you love that quote? Mr. Biddle has my complete understanding! I suppose I’ll climb his trail another day. At the bottom of the trail again, we saw from the map that we were at the trailhead of another short hike to tiny Ridell Lake, and we went there instead. The day had begun grey, cold, and windy, but along the trail we were sheltered from the wind and the sun broke free. Soon we were warmed and delighted by the views of Beacon Rock, which we never would have found otherwise. I took the photo above. We heard a crash in the trees nearby that sounded as if it had been made by an animal as large as a deer, and both of us stopped in our tracks and listened. 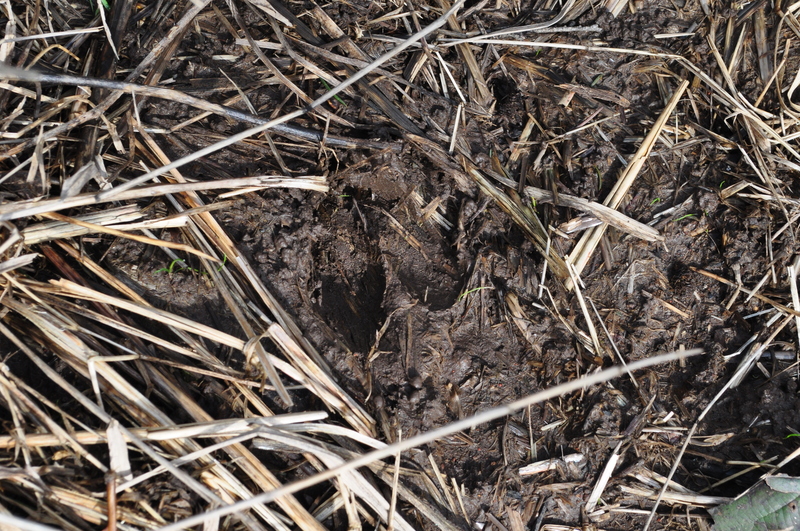 We caught no sight of the source of the noise until I looked at the sharp impressions in the mud at our feet, which confirmed that it had been a deer. We spotted wild daffodils as well – just about to bloom! 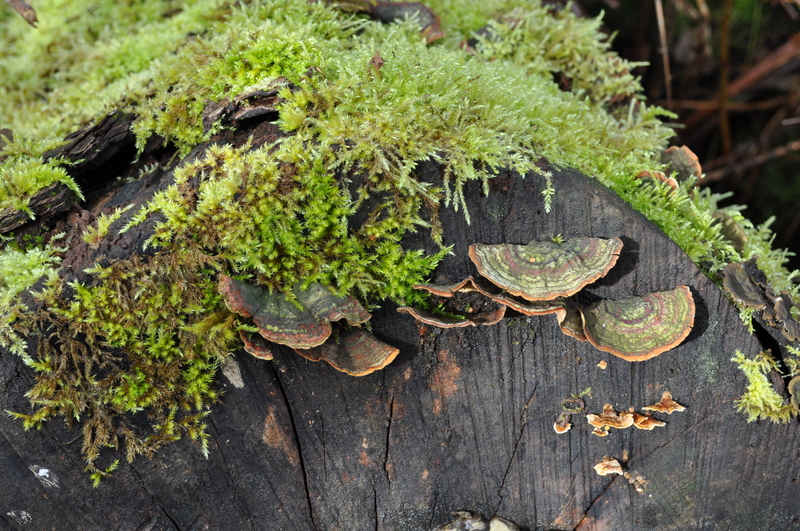 And the sun lit up a gorgeous fungus on the cut end of a log along the trail. Click the photos to enlarge the images. Beacon Rock was known as an important landmark to Native Americans, who called it Che-che-op-tin, and it was first described in English by William Clark (half of Lewis & Clark) in 1805 and again in 1806. It was formed in the core of a volcano when molten basalt erupted. The Columbia River, and perhaps the famous Lake Missoula floods, wore away the outside of the small volcano, and left this striking wedge of rock for us to enjoy a thousand years later. Looking toward Oregon, the PCT sign on the right. 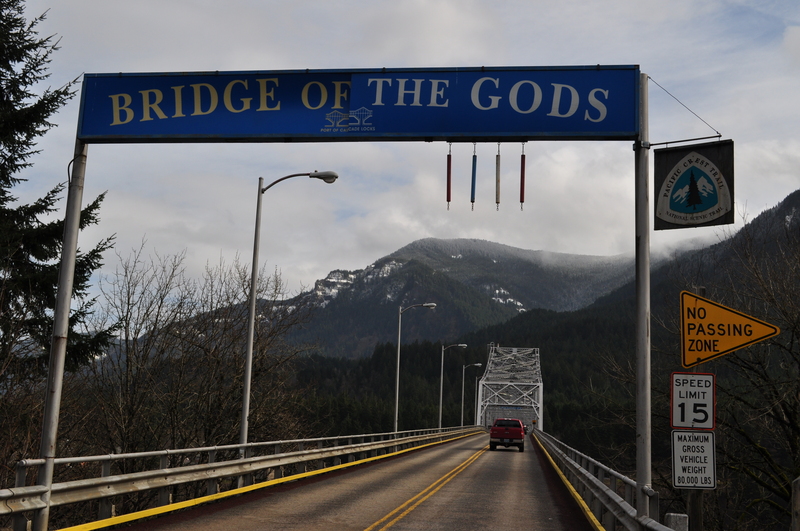 We stopped before returning home along the Bridge of the Gods because we wanted to see how pedestrians would cross the great Columbia. There was no footpath, but it was clear the Pacific Crest Trail came out at this place. Further, the sign across the entrance to the bridge also declared it to be part of the PCT. Arno pulled out his magic phone and soon had the answer from the Internet: hikers walk across the bridge and pay a 50 cent toll like everyone else. The speed limit is 15 miles an hour, so that makes up for the apparent danger of having no safe place to walk other than in traffic. Hungry by this time, we went into Stevenson for lunch and had a lucky find at Big River Grill, approved by the Sturgeon General, where we had scrumptious salmon cakes for an appetizer and could hardly settle on what to eat since nearly everything on the menu sounded perfect. 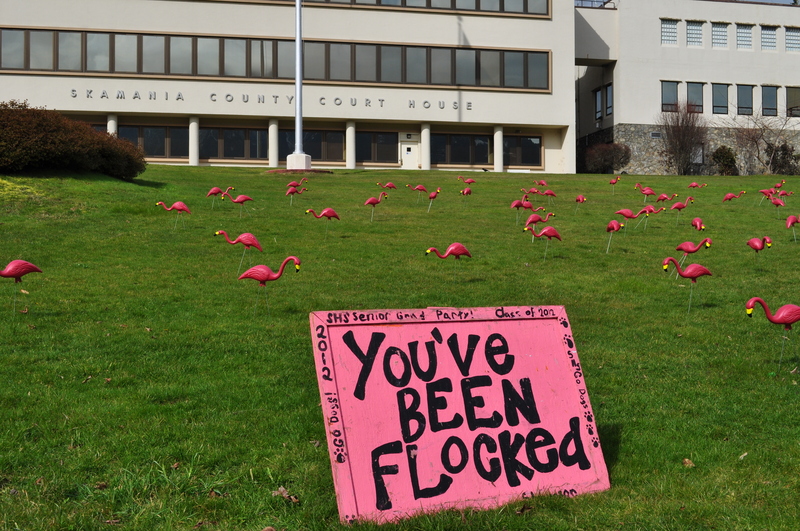 Across the street, the Class of 2012 had flocked the Skamania County Courthouse. Just to be sure that we had the information correct, Arno asked at the tollbooth as we left the bridge, and it was confirmed that people were allowed to walk across the bridge. 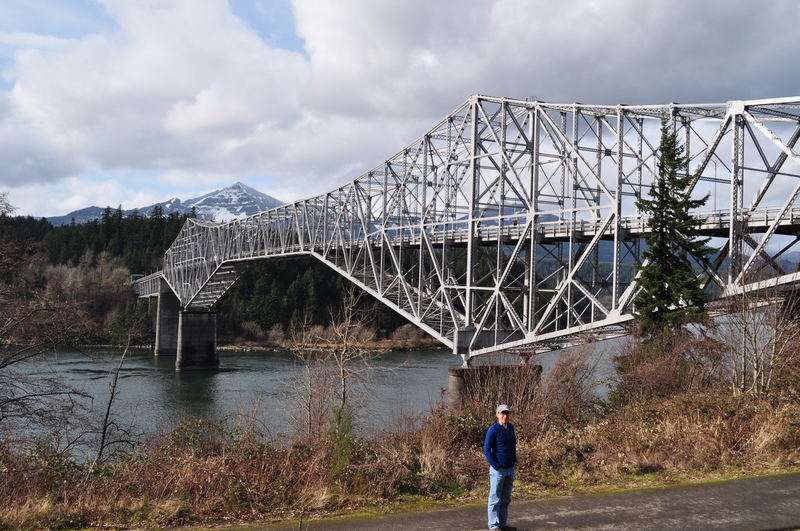 We stopped at Cascade Locks on the Oregon side for photos of the bridge, with picturesque snowy peaks of southern Washington in the background. Reblogged this on An Interesting Life!. Thank you Alyson for reblogging! I’m looking forward to reading more on your blog, and maybe locating some good climbing spots. I love this post. Each time I’ve passed through the gorge I’ve wanted to stop and enjoy it’s beauty. Unfortunately, I’ve been headed somewhere with time restraints and been unable to take the detours. One day I am going to make this gorgeous place my destination. I am going to grab you up as my guide too! What fun we will have and your blog will be full of laughter and secrets. Make it your destination one of these days, and I’ll be happy to drag you on trails all over the place! I’m glad you enjoyed the photos, Gloria. Thank you for visiting my site. I can not believe that door / lock! And I really want to get to the Gorge and also to walk across the Bridge of the Gods. What amazing country you live in! I feel genuinely grateful to live here. As Arno likes to say: Many people plan vacations for half the year to come here, but I live here!